We love Detroit, we put our house [in Holland] up for sale. We are moving to Detroit because it is such a good city; it is such a city of opportunity.” says Mrs. Mascah Poppenk (photo shown), the co-producer of Grown in Detroit, the winner of this year’s Best Documentary at the Detroit Windsor International Film Festival (DWIFF), which was hosted at Wayne State University from June 24 to June 27. Detroit has been turning itself into a city known for tis large filmmaking industry. Michigan passed a tax credit three years ago that has made filmmaking in Michigan extremely attractive. 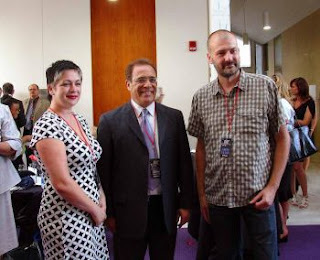 The Detroit Windsor International Film Festival is a chance to rediscover Detroit, not as an automotive city, but as the center of media and culture. From the 1940s to the 1980s, Michigan was the largest producer of film in the United States. With over 180 film entrants this year, the DWIFF is promoting international cultural awareness in the arts as well as working with local colleges to foster the training of talent right here in Michigan. Michigan currently has a program in place designed to guarantee jobs for those who study film here in Michigan. At the DWIFF VIP reception on June 24, Mr. Richard Jewell, a member of Michigan’s Film Office Workforce Development, introduced a grant in effect at Wayne State University, Michigan State University, the University of Michigan, and three other community colleges that sponsor students studying gaming animation and motion capture. Graduates are promised jobs on completion of the film programs. There are also programs being implemented in grades K-12 that prepare children for work in film. For example, River Rogue, a high school in the area, hires students to create high quality projects in the entertainment arts. The goal is to train people in Michigan, keep them in Michigan, and grow a local talent base that will be sought by people from all over the world. The efforts of the DWIFF and the city of Detroit to make Michigan a leader in the film industry have been working. “This year, we are happy to bring in filmmakers from Hollywood and other countries to share their experiences with filmmaking here in Michigan,” says Ms. Suzanne Jenik, the DWIFF Director of Operations, who has been volunteering for DWIFF since the program’s initiation in 2008. One of the reasons the film industry has been able to develop so fast in Detroit is because of the enthusiasm of the local people. With such efforts, Michigan will soon make its name well known all over the United States as the place to produce films, to study filmmaking, and to find film industry talent. Ying Wan contributed to this article.